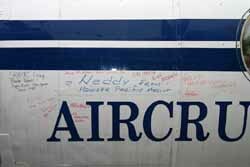 On 03Dec2004 the Aviodrome concluded the purchase of VH-NLS from Aircruising Australia. 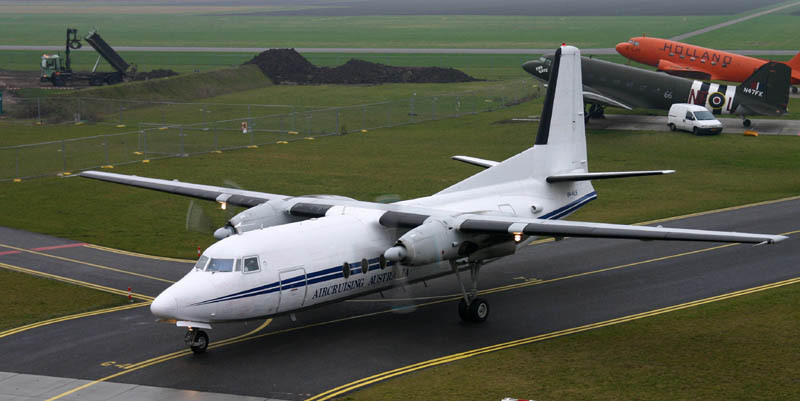 The Aviodrome had bought the oldest flying Fokker F.27, in cooperation with the F27 Friendship Association (FFA). Restoration and operation of VH-NLS will be shared by both in the Fokker Heritage Flight. A ferry crew from Aircruising Australia brought VH-NLS in 10 days (departure 06Dec, arrival 15Dec.2004) back to its roots, back to the Netherlands. Fokker Friendship VH-NLS is seen passing the threshold of Lelystad's runway and is about to touchdown on Dutch soil, completing a impressive ferry flight all the way from Sydney, Australia. The day provided dismal weather: low ceiling and a slight drizzle, but the arrival of VH-NLS warmed many hearts. 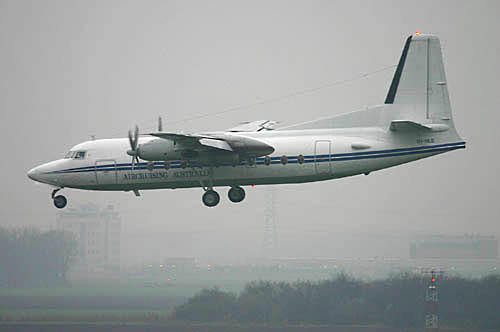 This day, December 15th 2004, was also the 46th anniversary of the first production Fokker Friendship F.27 making its first commercial flight: this F.27 (model F-5), with construction number 10105, flew for owner and operator Aer Lingus (as EI-AKA) between Dublin and Glasgow on Dec.15th, 1958. 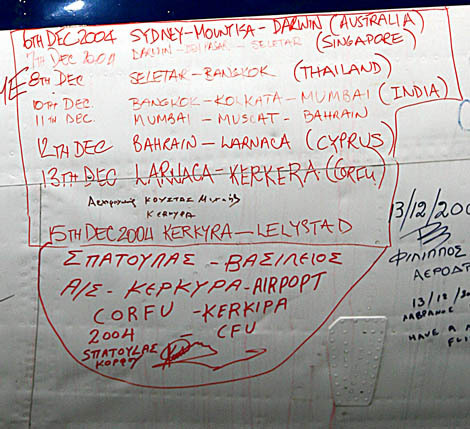 The ferry flight from Australia lasted over 52 hours airborne time, the route was flown in 10 days. 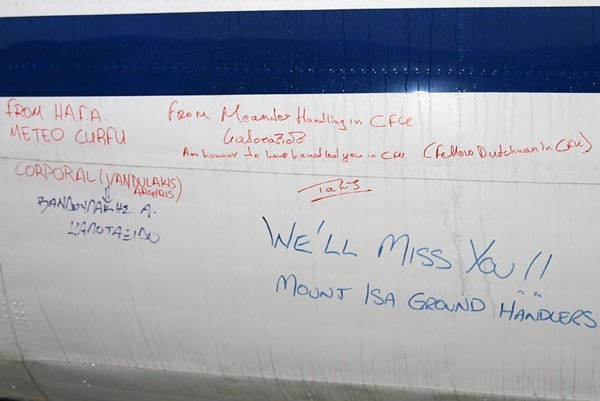 Thank you so much for such magnificent photographs which brought back memories, such like: as the Aer Lingus reservations manager in London in the late 1950s I recall getting a memo from head office in Dublin informing us that we were to refer to our new aircraft (EI-AKA) as a "Friendship" for reasons I'll let you guess (having to do with a word which rhymes with "Fokker"). VH-NLS is seen passing the "Queen of the Skies" N749NL. The sound of the engines could not be more different: the high pitched screeching sound of the Rolls Royce Dart engines is not favored by me over the rumbling Wright Cyclones, but there is impressive history in both. 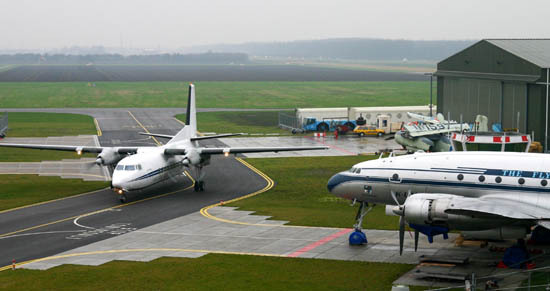 The Fokker F.27 Friendship has proved itself to be a worthy successor of the Douglas DC-3 and it was only fitting that 2 Dakota's (or Gooney Birds) witnessed the arrival of the oldest airworthy "Friendship". 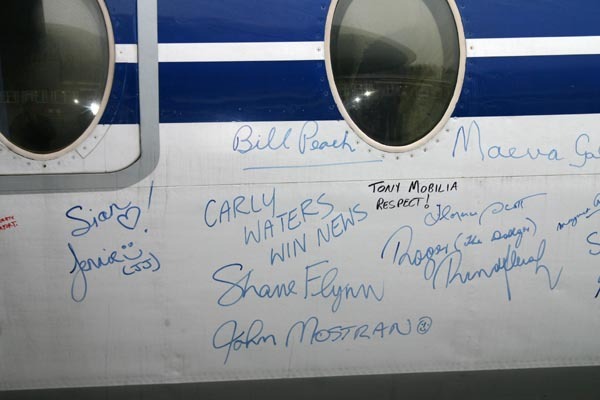 Roger McDonald wrote me: "Incidentally, newspaper reports suggested a group in Tamworth (the birth place of East-West Airlines) were investigating the purchase of the aircraft for static display in the original East-West colours. Of course, East-West being my favourite airline, I was quietly excited but nothing came of it. Probably just as well !" 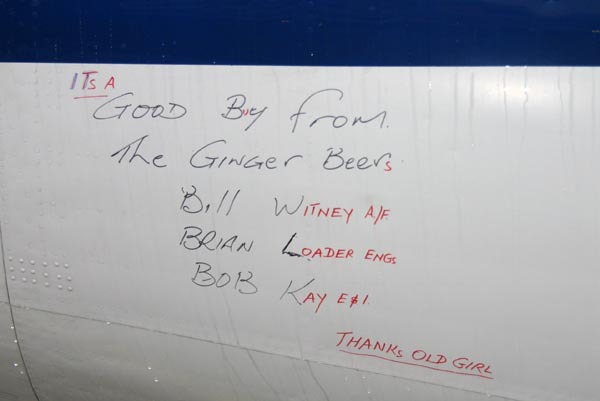 Thanks Roger, and I agree: this fine lady is in too fine a condition to retire to a static display !! Well-deserved congratulations all around ! 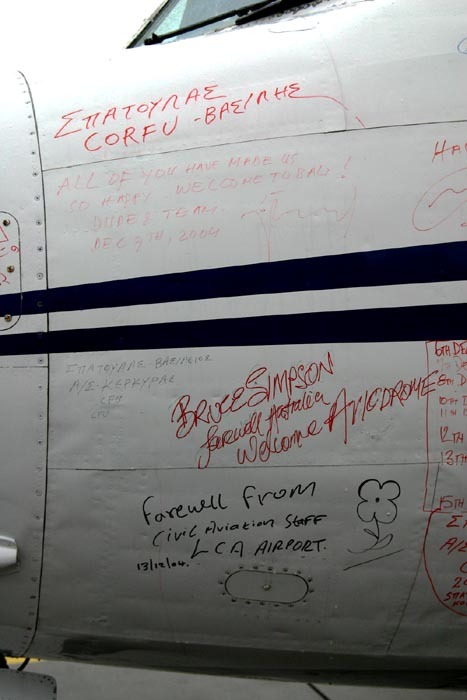 Aviodrome's big boss Arno van der Holst (yes, the tall guy in the middle) is seen shaking hands with Bruce Simpson; Jan Maasdam (left of Arno, Jan is ex/F.27 demo pilot of the Dutch Air Force and flies the B-25 of the SKHV) joined the crew in Corfu; right of Bruce is seen Peter de Raaf (Fokker Heritage Trust) congratulating the other "Ozzies". "Bruce was President of Australian Warbirds for a while and he is a long-time H.A.R.S. member. 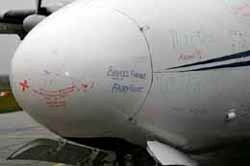 He's a qualified test pilot, LAME- and QANTAS pilot, last heard of as the boss of the QANTAS A330 programme (and ferried the first of type to Australia). 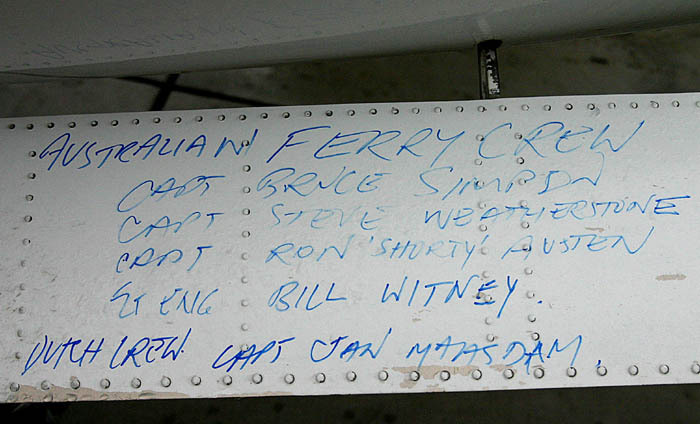 He captained a C-60 Sydney-Brisbane-Norfolk Island-New Zealand going to Wanaka in 1992. We lost engine number 2 at PNR+1 and we could not maintain height, we were lucky to make Kaitaia (right at the northern tip of NZ); a ditching looked likely for a long time. Oh well, it made a great magazine story afterwards and we did get to Wanaka, though it was by C-402 ! The routing of this excellent adventure: this 1958-vintage airplane performed extremely well ! C/n 10105 was delivered to Aer Lingus on 19Nov58 as EI-AKA, sold to New Zealand National Airways in 1966 (became ZK-NAH, for all of its service with NZ National Airways / Air New Zealand) and ended up with Aircruising Australia in 1985 (becoming VH-NLS). It is expected to see a Dutch registration be assigned to it and as such c/n 10105 will cruise European skies again in 2005 (and hopefully long after !). 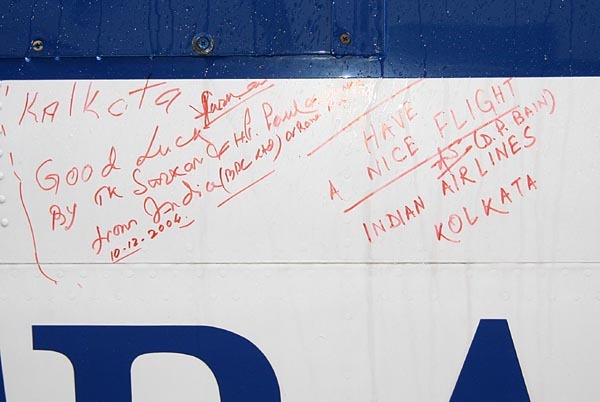 "I look at this website and remember well the wonderful trip I had on this wonderful aircraft in August 2004 as Flight Director. 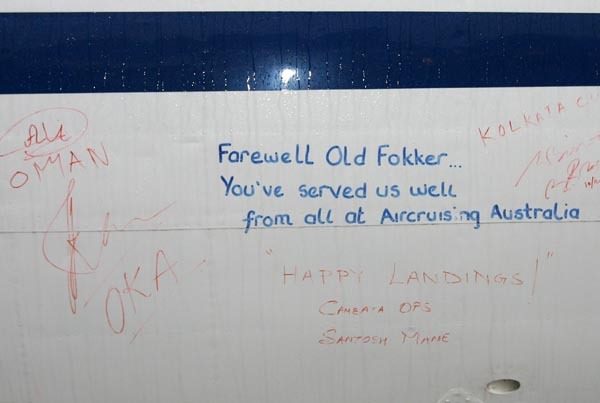 It brought tears to my eyes to realise I will no longer have the pleasure to work on a Fokker Friendship. 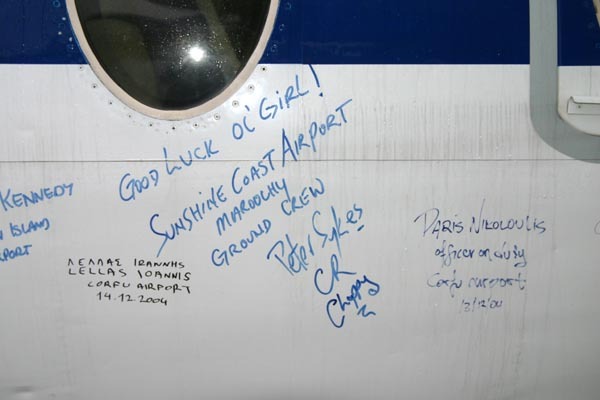 I started my career with Air New South Wales on F27 and was Flight Attendant on VH-FCB when the gustlock went into lock during flight, some say we are very lucky to be here. 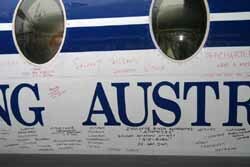 I enjoyed 27 more wonderful years flying with Ansett and have recently had the pleasure of crewing this beautiful aircraft. Virginia Jeffries" Many thanks Virginia ! Four ferry tanks were installed. VH-NLS still has the original interior of the 1950s: look at those window curtains ! 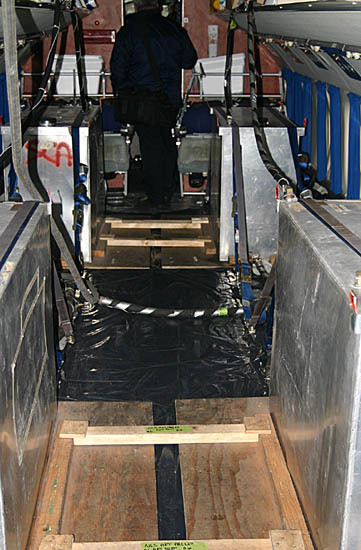 The seats were removed and stored on top of the others in the aft cabin. 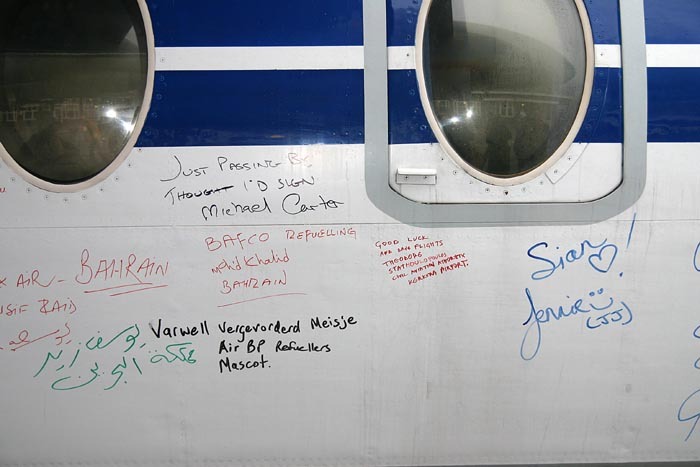 The next day, 16Dec04, VH-NLS was ferried to Stork at Woensdrecht for a major overhaul. Next season will see VH-NLS operate the airshow circuit. The Aviodrome added again a valuable vintage transport, even more valuable for the Dutch Industrial Heritage as it was produced by our own Fokker Aircraft Industries. To see it in such pristine condition is a testimony to the successful design of the Fokker F.27 ! Ferry crew: Capt. Bruce Simpson, Capt. Steve Weatherstone (Chief Pilot Aircruising Australia), Capt. Ron ("Shorty") Austen, Ground Engineer Bill Witney (and added Capt Jan Maasdam). 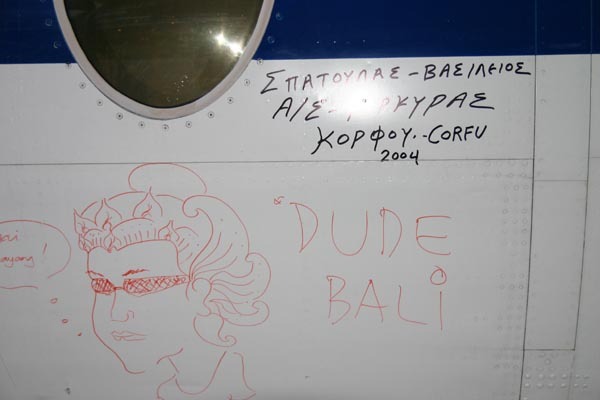 It was Aircruising Capt. 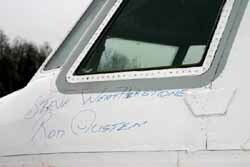 Steve Weatherstone who contacted the Fokker Friendship Association, indicating the first F.27 productionmodel was for sale and this got the ball rolling. The HARS - Historical Aircraft Restoration Society inspected the aircraft and gave the thumbs up: purchase and ferry cleared to go ! I've just viewed your VH NLS web-page - well done. 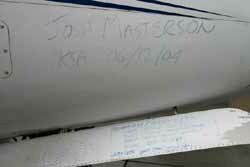 Some aviation trivia for you - I am possibly the only pilot to have been trained by both Ron Austen (F27 December 1973) and Jan Maasdam (F50 Oct/Nov 1992). 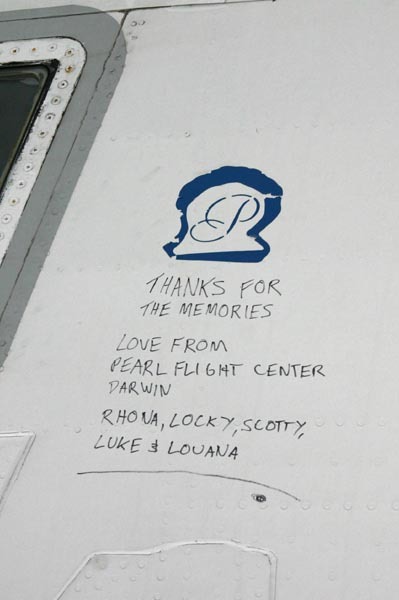 Out of 19,000 hours my Fokker experience totals 14,000 hours (F27: 7,500; F50: 2,500; F28: 2,800; F70:1,200) flown with East-West Airlines (Australia), TAT (France) and KLM Cityhopper (The Netherlands). 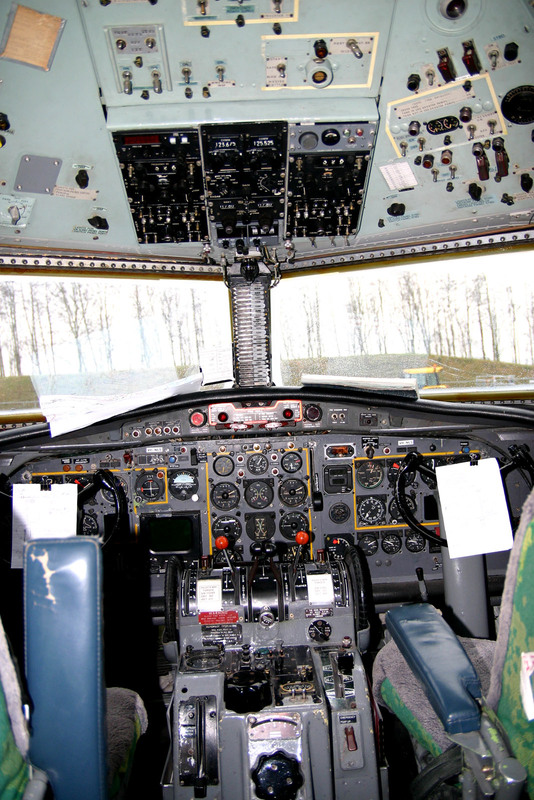 I was a Line-Training Captain on F27, F50 and F70 and a Sim instructor and Check Captain on F50. I now fly B737 -700 and -800 with Virgin Blue. Please give my regards to Jan.
Lee Godfrey Many thanks Lee ! 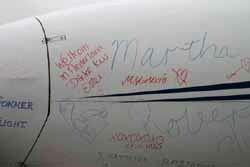 Hi Ruud, Thank you for your coverage of the ferry and arrival of VH-NLS into Lelystad. 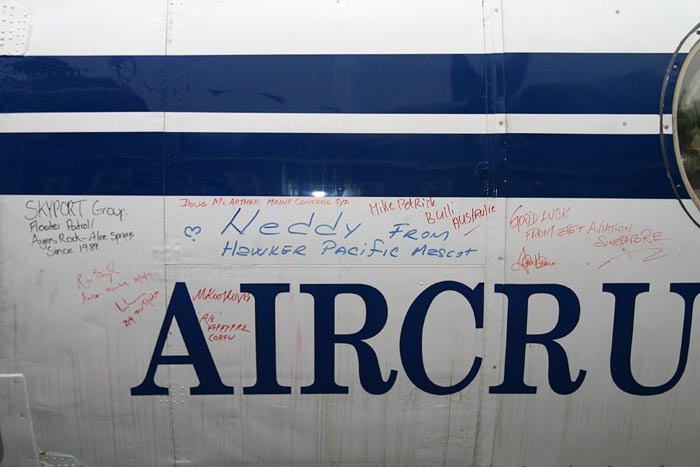 For the ferry crew it was a most rewarding and emotional experience, delivering F27 S/N 005 back to its homeland, to a well-earned and deserving retirement. 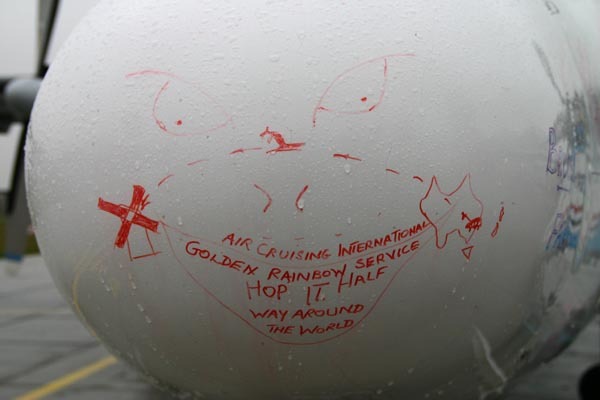 During its 20 years of service with Aircruising Australia, S/N 005 provided a consistent track record of incredible reliability. The RTF radio callsign we used for VH-NLS, was �Cruiser 900�. 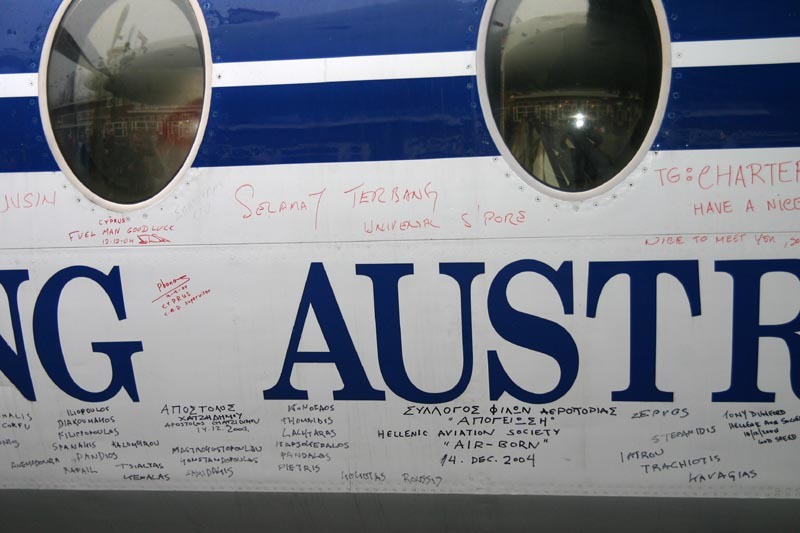 All the crews and regular passengers of Aircruising Australia, who appreciated the security and comfort provided by that beautiful old Fokker, will certainly miss her. Many thanks for the kind words Steve ! 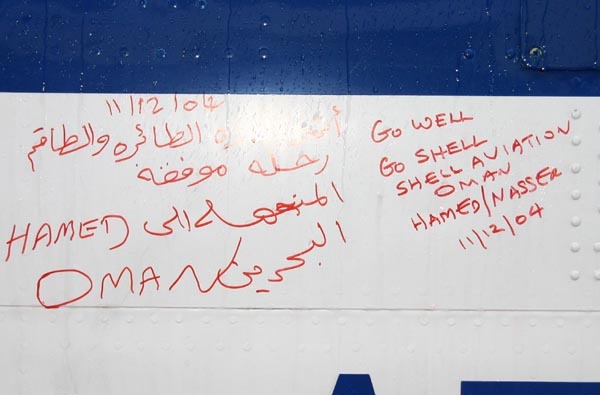 And thanks for taking good care of VH-NLS, I am sure this 'Friendship' will quickly make new friends !! 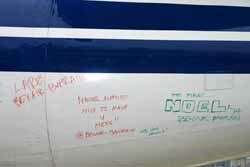 Shortly before VH-NLS left Sydney-Mascot on 06Dec04, Paul Daw took this photo: look at that clear blue sky ! 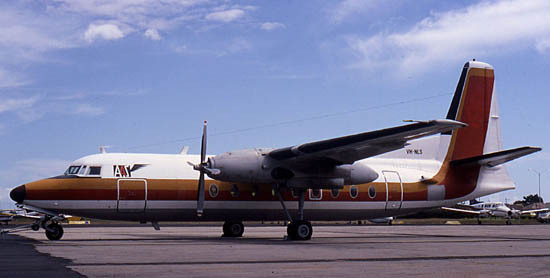 VH-NLS was photographed by Roger McDonald at Essendon 24Mar86 in a previous colourscheme of Aircruising Australia. 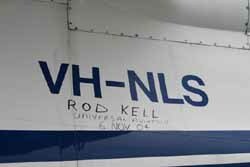 Roger photographed VH-NLS on 18Jan86, again at Essendon, in the livery of A.A.S. 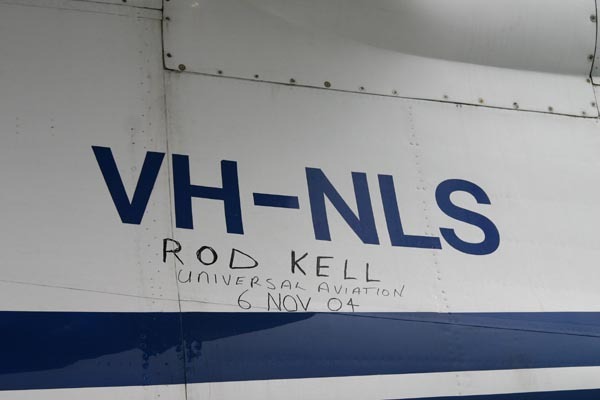 (Australian Aircraft Sales). After N.Z.N.A.C. 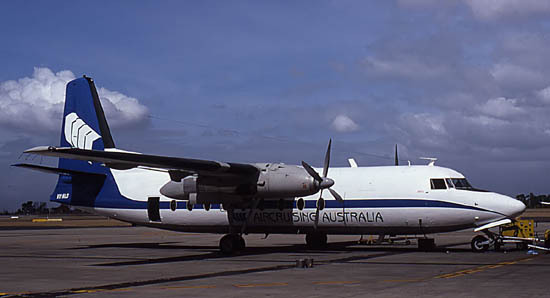 sold it to Australian Aircraft Sales, it sat at Tullamarine for 12 plus months before being purchased by Charter Cruise Air Limited (later renamed Air Cruising Australia Limited) It was rolled out in it�s new marks early March 1986. Peter Layne wrote me: NZNAC owned ZK-NAH, as she was in New Zealand, at the time of the Air NZ/NAC takeover/merger taking place. The paint scheme with red and orange band was an interim scheme based on NAC's colours and Air New Zealand's style at that time i.e. 1978. 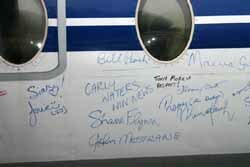 I had the pleasure of flying in ZK-NAH as an NAC passenger in March 1969 between Invercargill and Dunedin. A fine detail was added by retired NAC Captain Bill Howell: "all NAC F27s with short noses (including ZK-NAH) had them replaced with long noses". Many thanks, indeed a finer point probably missed by many. 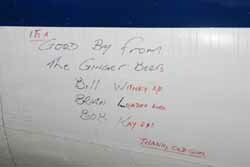 2004 sees the end of an era for Bill Peach Journeys as their well-travelled Fokker Friendship F27 touched down with great fanfare in the Netherlands today where it will go on display as a working museum piece. The aircraft was piloted by Bill Peach Journey�s Captain Stephen Weatherstone and Captain Ron Austen. 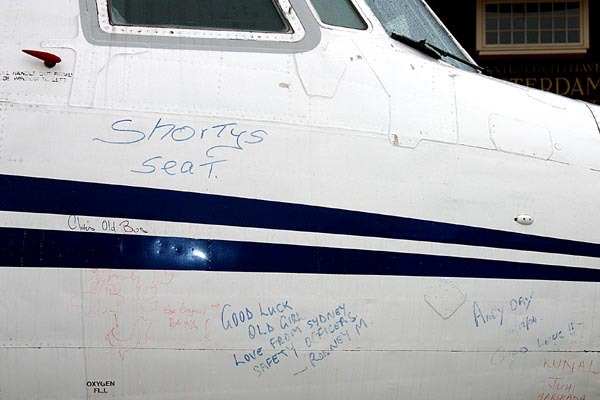 The aircraft will remain at the Aviodrome, an air travel theme park in Lelystad, Holland. After quite an epic journey beginning in Sydney the journey took the two experienced captains to Singapore, Thailand, India, Bahrain, Oman, Cyprus, Greece, Italy and on to Holland. 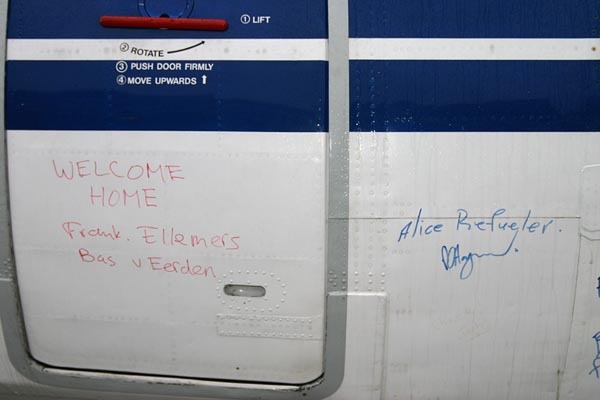 The Fokker Friendship began its long and distinguished career with Aer Lingus in Ireland 46 years ago. Bill Peach Journeys purchased the aircraft in 1985. 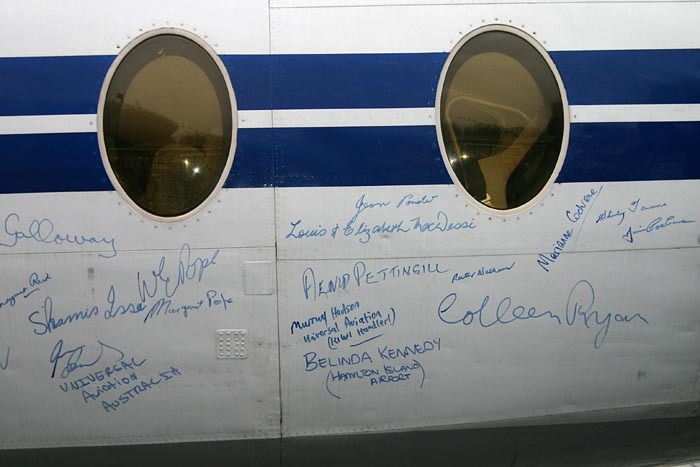 The high wing configuration and the large windows of the Fokker F27 provided the perfect aircraft for Bill Peach Journeys Aircruising programme providing uninterrupted views of the landscape below. This particular Fokker was the oldest commercially flying aircraft of its type in the world. 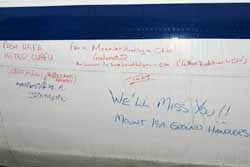 Although many regular travellers and staff at Bill Peach Journeys were sad to see the faithful Fokker go, 2005 will see some very exciting developments within the company. Bill Peach Journeys has released its largest programme of itineraries since the company was founded in 1983. The ongoing popularity of these unique and stylish journeys by private aircraft throughout Australia and New Zealand will certainly be enhanced by the introduction of the De Havilland Canada Dash 8 aircraft to the Bill Peach fleet in 2005. 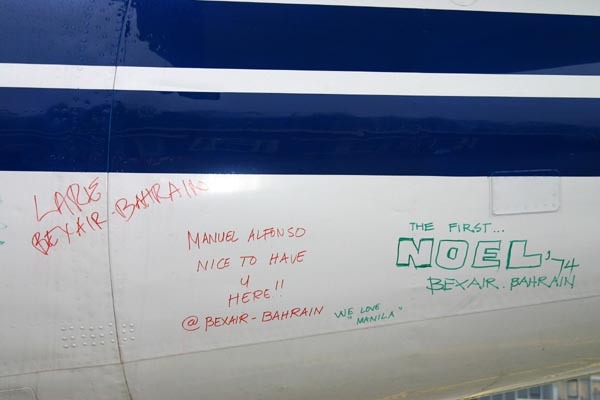 The Dash 8 will fill the void left by the Fokker F27 as it provides the same uninterrupted views with its high wing configuration. 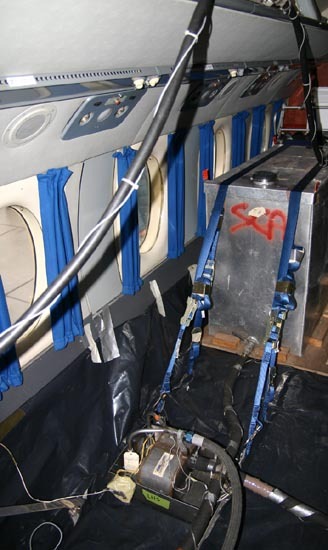 The modern aircraft will bring many improvements operationally and several on board enhancements. 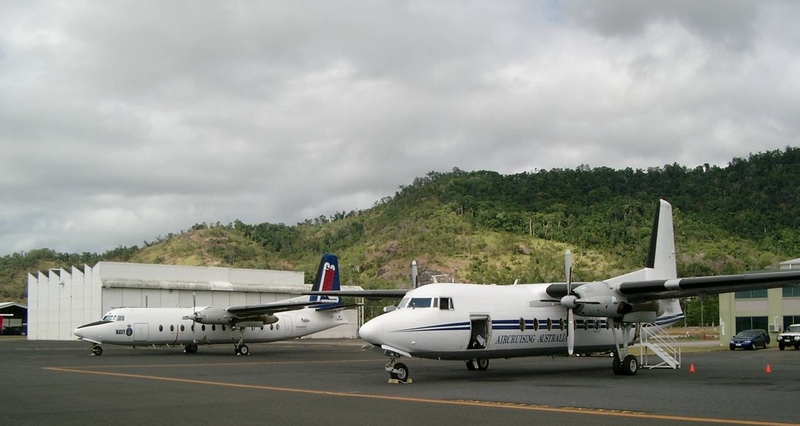 Stephen Weatherstone sent me a photo of VH-NLS and VH-EWP at taken at Cairns, North Queensland in October 2003. 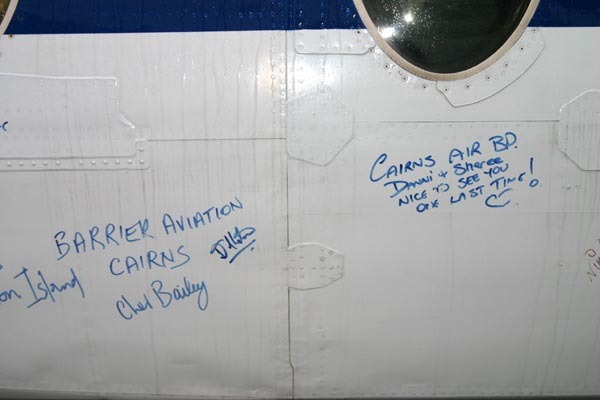 Both aircraft were at the time operated by Aircruising Australia. 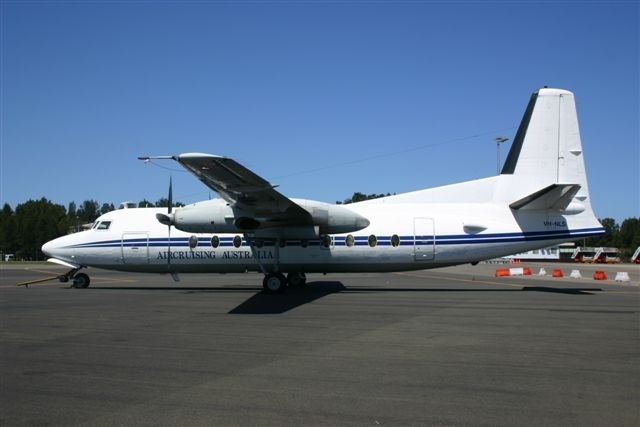 F.27-500 VH-EWP (c/n 10534) is owned by the Royal Australian Navy and used for Laser Airborne Depth Sounding, mapping the ocean floor. 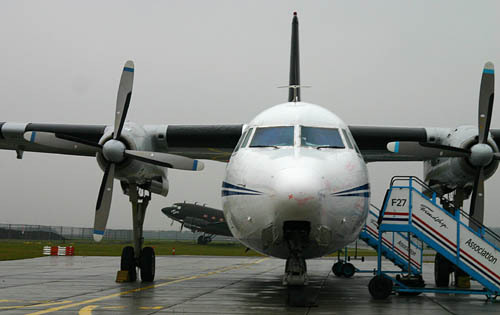 Aircruising is operating VH-EWP under their AOC for the RAN (anno 2005), while Executive Airlines are the approved Maintenance Organisation. 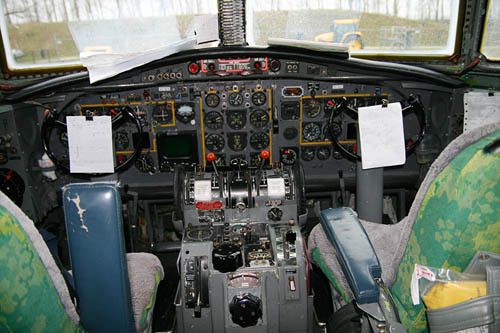 I have just read your web site regarding the first F27 off the assembly line. 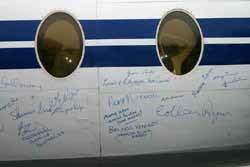 I flew this aircraft out from Holland for N.A.C. in July 1966 with Jack Leech as my co-pilot, Jock Belsey as the engineer and a Dutch Fokker pilot as liason. He was later killed in the east in a F28, I believe. It was a difficult flight for me as I cleaned my teeth with hotel water at Damascus and finished up with the "Black Death"! The aircraft was in very poor condition performance-wise, especially in the areas of hot climates, so our take-off critirea was critical. 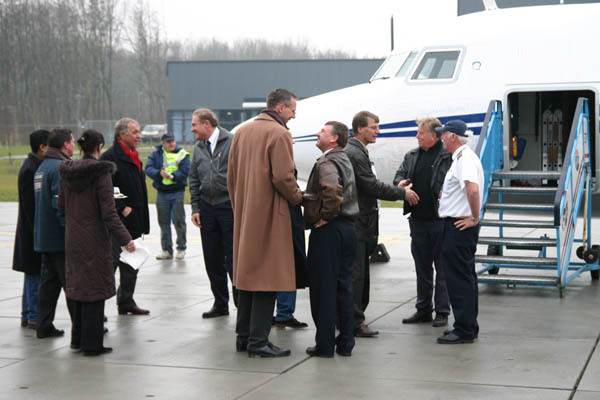 Arno van der Holst and volunteers of the Aviodrome, for their hospilaty and information. F27 Friendship Association (FFA), provided most of the historical data. 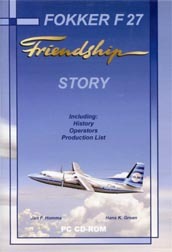 After years of research Hans K. Groen and Jan F. Homma have produced this CD-ROM: "The Fokker F27 Story". 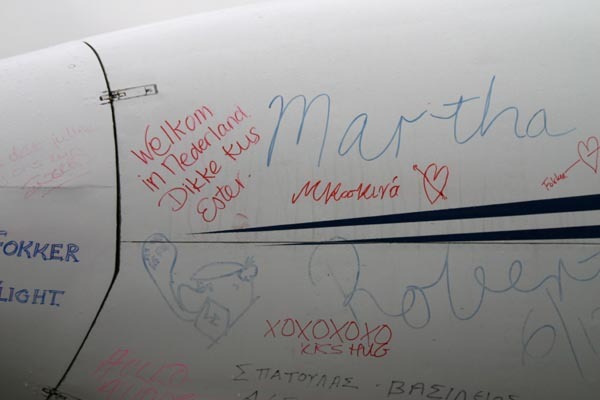 It contains the development, production, operations and crashes of the Fokker F27. Over 3.000 pages to browse through and featuring a large selection of images and individual aircraft histories. 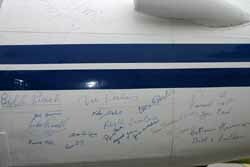 The first 'complete' story of the famous Fokker turboprop! The CD-ROM costs EUR 29,95 (excl. postage & packing) at the time of writing: May 2011. Please email your order to: hansklaasgroen2 -ATsign-hotmail -dot- com, or by writing to: Hans K. Groen, Archimedesweg 19, 1098 JK, Amsterdam, Netherlands.